The class blog widget provides a handy link to all student blogs attached to My Class. Students just need to click on the link to easily go to a class mates blog. The Class blog widget only appears in Appearance > Widgets inside the class blog and student blogs when My Class has been set up. Refer to My Class support page to learn more about setting up and using My Class. Title: Allows you to add your own custom title. For example, Student blogs. Displays: Allows you to control what is displayed in the student blog list. In most situations you would leave it as ‘Blog Name only’. Display options are: Avatar + Blog Name; Avatar only; Blog Name only; Avatar + Blog Domain; Blog Domain Only. 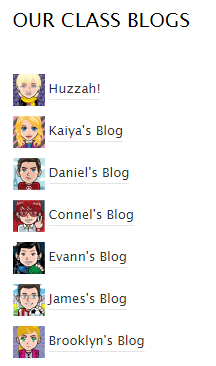 If you choose an avatar option students need to upload their blog avatar via Settings > Blog Avatar. You can’t use Avatar display options if you have selected to display more than 20 blogs. Blog Name Character: Used to control the number of characters displayed. In more situations you would leave it as 30. Public Only: Change to No if you are using a private blog option on your student blogs. Order: Controls the order used to display the student blog list. In most situations you would change this to alphabetical, and we recommend students are encourage to use their first name in their blog title e.g. Max’s Blog, to make it easier to find specific student blogs. Order options are: Random. Alphabetical, Most Recent. 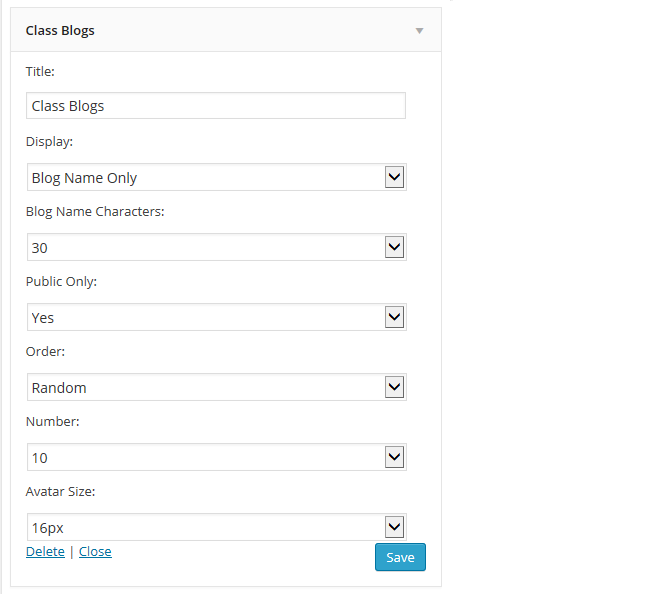 Number: Controls the number of blogs that are listed in the class blog widget. This number should be adjusted to the number of student blogs you have otherwise it will show only 10 blogs. We’ve highlighted the main settings you need to adjust on the class blog widget below. Remember to click Save after changing any settings. The class blog widget isn’t automatically updated when you add new student blogs, or when student’s change their blog title. Go to Appearance > Widgets, open up the Class blog widget and click on Save to update the Class blog list.